2nd one got my vote. Whoever it is... *bows down*..
That Hulk is awesome...good job! #3 , one doesn not simply take a cut out comic of spider man and fills it with non comic elements. It's the only reason why it doesn't look good. More explanation? Although It's creator wanted to add more depth of field and washed out colors that seem to be trending nowadays, the elements really doo look like something slapped on a piece of paper. Not sure what the right side's tiny "error" wants to represent, supposed to make it look good, but it's a trademark, so I already know who made it. #1 great character placement, and usage of shapes and lightning. Could have chosen another character but the one he used also fits in pretty well. The typography is matching too! 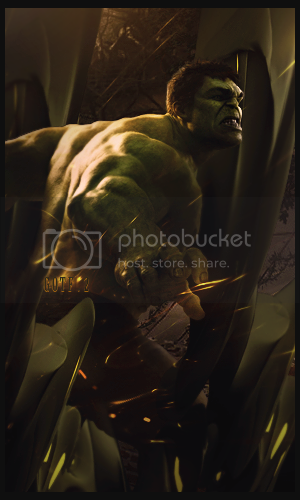 #2 above people say that the hulk one looks the best. In my opinion that c4d is out of context, does not match, and you can clearly see it's just a standard c4d rather than something that would blend in as somekind of special effect. Although he did a great job with the lightning strokes and the typography, he could have done better. The winner is @Schiwa. Congratulations! Final battle will be against @Mucski and @Schiwa. The thread will be up soon.